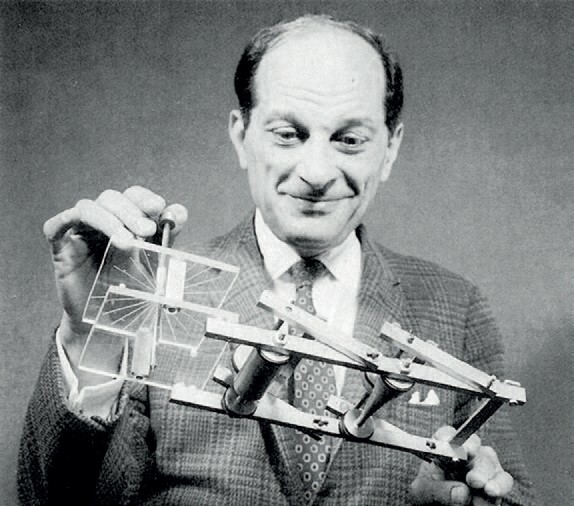 Stanislaw Ulam, the nuclear scientist who first had the idea of nuclear bomb propulsion (Credits: Universidad de Guadalajara). Studying the space age, future historians may agree on the significance of a date not generally associated with space flight. July 16th, 1945, was Trinity, the first nuclear weapon test. Stanislaw Ulam, a 36-year-old mathematician who helped build “the gadget” visited ground zero after the test. Ulam later conceived the idea of propelling a spaceship with atomic bombs. When considering nuclear propulsion, it must be understood that space is not an ocean, even though it’s often characterized as one. The distances and conditions are not comparable. Fossil fuels, burned and transformed by steam into mechanical work, would radically change the world in the span of a century and enable the industrial revolution. What is difficult for moderns to understand is not only how limited human capabilities were before steam, but how limited they are now in terms of space travel. Chemical propulsion is incapable of taking human beings to the outer solar system and back within the crew limits of a few years. The solution is a reaction one million times more powerful. Nuclear energy is to the space age as steam was to the industrial age. Space is not an ocean, and this was the correct lesson drawn by Stanislaw Ulam. While metal can barely contain and harness chemical energy, Ulam thought outside that box by accepting that nuclear energy could never be contained efficiently by any material. However, nuclear energy could be harnessed to push a spaceship in separate events to the fantastic velocities required for interplanetary travel, without any containment problems at all, by using bombs. After a half century, atomic bomb propulsion still has no competition as the only available propulsion system for practical interplanetary travel. This fact is almost completely unknown to the public. Physicist Freeman Dyson and weapon designer Ted Taylor on the top-secret project Orion did the first serious work on bomb propulsion. The “unclassified” state of the art in nuclear weapons can direct 80 percent of bomb energy into a slab of propellant, converting this mass into a jet of superheated plasma. A pusher plate would absorb this blast without melting for the fraction of a second it lasts and accelerate the spaceship in steps with each bomb. Perhaps the closest experience to riding in an atomic bomb propelled spaceship would be a set of repeated aircraft carrier catapult launches. In “The Most Powerful Idea in the World: A Story of Steam, Industry, and Invention,” author William Rosen theorizes that English patent law was the key enabler of the industrial age by allowing inventors to retain and profit from their intellectual property. In the space age, fears of weaponizing space have had the opposite effect. Ironically, the nuclear industry is not safe on Earth, but deep space seems designed for it. The space industry is ipso facto a nuclear industry. All astronauts are radiation workers. The presence of a small percentage of highly damaging and deeply penetrating particles – the heavy nuclei component of galactic cosmic rays – makes a super powerful propulsion system mandatory. The great mass of shielding needed renders chemical engines, nuclear thermal, and the low thrust forms of electrical propulsion essentially worthless for human deep space flight. Bomb propulsion is left as the only “off the shelf” viable means of propulsion. For the foreseeable future, high thrust and high specific impulse to propel heavy shielding to the required velocities is only possible using bombs. 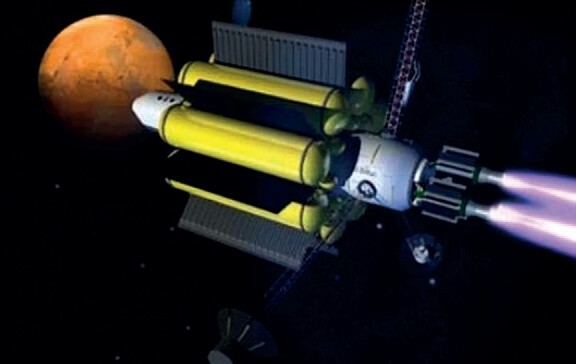 Artist’s conception of a deep space spaceship, using water tanks as radiation shielding (Credits: NASA). The most useful and available form of radiation shielding is water. While space may not be an ocean, it appears human beings will have to take some of the ocean with them to survive. In the March 2006 issue of Scientific American magazine, Dr. Eugene Parker explained in simple terms survivable deep space travel. In “Shielding Space Travelers”, Parker states, “cosmic rays pose irreducible risks.” The premise of this statement is revealed when the only guaranteed solution to reducing the risk, a shield massing hundreds of tons, is deemed impractical. Active magnetic shields and other schemes are likewise of no use because while they may stop most radiation, the only effective barrier to heavy nuclei is mass and distance. The impracticality of a massive shield is due to first the expense of lifting hundreds of tons of shielding into space from Earth, and secondly propelling this mass around the solar system. Propelling this mass is not a problem if using atomic bombs; however, another problem arises. There is still the need to escape Earth’s gravitational field with all that shielding. Bomb propulsion is ideal for deep space but cannot be used in Earth orbit due to the Earth’s magnetic field trapping radioactive fallout that eventually enters the atmosphere. Not only lifting the shielding into orbit but chemically boosting it to a higher escape velocity away from the Earth is thus doubly problematic. 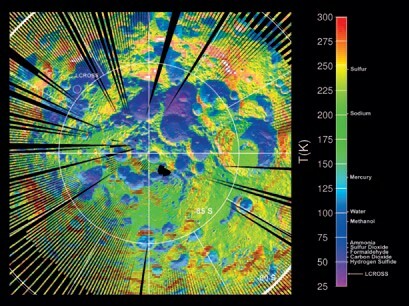 The situation changed in March 2010, when NASA reported Mini-SAR radar aboard the Chandrayaan-1 lunar space probe had detected what appeared to be ice deposits at the lunar North Pole, an estimated 600 million tons of ice in sheets a couple meters thick. Moon water would allow a spaceship in lunar orbit to fill an outer hull with the 500+ tons of water required to effectively shield a capsule from heavy nuclei. This would enable an empty spaceship to “travel light” to the Moon and then boost out of lunar orbit using atomic bomb propulsion with a full radiation shield. Parker’s guaranteed but impractical solution had suddenly become practical. Fourteen feet of water almost equals the protection of the Earth’s air column, and this would protect astronauts from all forms of space radiation. With water and bombs, epic missions of exploration to the asteroid belt and outer planets are entirely possible. deep space exploration (Credits: NASA). There are other challenges to long duration beyond earth orbit human space flight, but the solutions have been known for many decades. Zero gravity debilitation causes astronauts to weaken and permanently lose bone and bone marrow mass. The most practical solution, theorized since the early 1930’s, was investigated in 1966 during the Gemini 11 mission. A 100-foot tether experiment with the capsule attached to an Agena booster was successful in generating a small amount of artificial gravity by spinning the two vehicles. Equal masses on the ends of a tether can efficiently generate centrifugal force equal to 1G. The concept is to “split the ship” when not maneuvering under power, so the 500+ tons of shielded capsule is on one end and the rest of the craft of equal mass is reeled out on the other end of a thousand foot or more tether. Looking out through 14 feet of water, the crew of such a spaceship would view a slowly rotating star field. Equipment to enable a closed cycle life support system, providing years of air and water, is now available in the form of plasma reformers and facilitated by tons of water in which to grow algae or genetically modified organisms. With Earth radiation, Earth gravity, and air and water endlessly purified on board, crews can push their psychological limits as far out into the solar system as the speed of their atomic spaceships allow. observed in comets (Credits: NASA). As of 2011, there are zero prospects for funding a long duration beyond earth orbit mission. Using atomic bombs to propel spaceships around the solar system would cost as much as several major U.S. Department of Defense projects combined. However, there is a completely valid military mission for atomic bomb propelled spaceships. Planetary protection became an issue in 1980, when the Chicxulub impact crater in Mexico was assigned blame for the mass extinction of the dinosaurs. The human race needs to be protected, but not only from random impacts that could strike the Earth at any time. In April of 2010 physicist Stephen Hawking warned of alien civilizations posing a threat to humanity. Comets purposely crashed into a planet to wipe out the majority of indigenous life and prepare for the introduction of invasive alien species may be a common occurrence in the galaxy. Before readers scoff, they might consider towers brought down by jetliners, the discovery of millions of planets, and other recent unlikely events. At this time self-defense is the only valid reason to go into space. Protecting our species from extinction is the ultimate moral high ground above all other calls on public funds. President Ronald Reagan in his 1983 Star Wars speech said, “I call upon the scientific community who gave us nuclear weapons to turn their great talents to the cause of mankind and world peace.” The best insurance for our species is to establish, in concert with a spaceship fleet, several independent self-supporting off world colonies in the outer solar system. The first such colony would mark the beginning of a new age. – By Gary Michael Church. Views and opinions expressed in this article are those of the author, and do not reflect necessarily those of IAASS, ISSF, or Space Safety Magazine. George Dyson, 2002, Project Orion: The True story of the Atomic Spaceship, Henry Holt and Company, LLC. Eugene Parker, March 2006, Shielding Space Travelers, Scientific American Magazine. William Rosen, 2010, The Most Powerful Idea in the World: A Story of Steam, Industry, and Invention, Random House. This article first appeared in the 2nd issue of Space Safety Magazine. For more great articles from our archives, check out our past issues.